Your closet gives out more clues about yourself than you think: it's a small, private and personal space that doesn't need to follow the "rules of appearance" all the other rooms are subjected to. Because of this, your closet can sometimes give glimpses of your soul. A messy closet in an otherwise clean house, for example, could be a sign of an extremely busy mother of three. While this is a pretty normal scenario, the same messy closet in a clean apartment of a single woman, could be an indication of some kind of turmoil. If you don't believe a closet could be so significant, think about what happens when you visit people's new houses: they give you a tour of the new place, they show you every room, the living room, the kitchen, they even show you the bathroom, but they rarely open closet doors for you to take a peak inside. Because there is not much to see, you might say, and you're right, but I also think it's because the closet is a sacred space. It's the place where you hide your "skeletons", and where you've been keeping "your secret" before you come out of it. So what does your closet say about you? Why is your closet so messy? A common complaint I hear is that you don't have enough closet space. Understood. But instead of crying about it, and waiting for a bigger house with bigger closets, how about you work with what you have? There's a simple solution: "organize" your closet. An organized closet will fit all your things, a disorganized one will constantly run out of space. But don't confuse organizing with cleaning. Cleaning your closet could temporarily create more room, but it is by organizing it that you will create the order you need, and if done correctly, you will only need to organize it once. After that, all you have to do is follow the system you have in place. So how do you organize a closet? It could take anywhere from a couple of hours to a whole day, depending on the present state of your closet, and the kind of changes you want to apply. If your closet is a total mess, I suggest you take everything out of it, and start from scratch. While I understand that it can be an overwhelming task, and that having all your wardrobe now lying on the floor, can make you think twice about dealing with this whole ordeal, it is a necessary step. Once everything is out, and your closet is empty, clean it. Scrub the shelves, wash the rods, and if it's a walk-in, wash the floor/vacuum the carpet. This is when you decide if you need to change anything in the design of the closet. Could you use an extra shelf? Should you add another rod? How about a shoe rack? 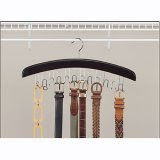 If you want to completely re-organize the look you can even buy a ready-made modular closet organizer. It's a series of shelves, drawers and rods that you can assemble yourself, to get the closet you always wanted. You can find some examples at Stacks and Stacks. While the closet is breathing fresh air, turn around and get ready to face your clothes. To make things easier just think of it as a game. Sort every piece of clothing into one of three piles: To Keep - To Discard - To Donate. Try not to put everything back in the To Keep pile, because that's not allowed. You need to seriously analyze your wardrobe at this time. Keep stuff that you absolutely love "and" wear. Discard anything ruined. Donate the rest. You should not keep anything that you don't wear. If you want to keep your clothes from a different size, put them in a bin and store them in the attic. Don't put them back in the closet. If there's a piece that has sentimental value, but that you don't wear anymore, put it in the bin as well. Once you've divided all of your clothes in the three piles, throw away the To Discard pile. Get rid of those clothes now, before you change your mind. Then put the To Donate pile in a bag and put it in your car, so that you will remember to drop them off by a charitable organization. Now all you have to do is organize your To Keep pile. This can be done in different ways, depending on the size of your closet and also your personal preferences. If your closet is big enough, you can keep all your clothes in there together. If not, you will need to separate them by season first, and put the out-of-season stuff in another bin, and store it somewhere else. Next, assign different parts of the closet to your work, casual and dressy clothes. You can also put the clothes in order of how often you wear them. Or keep the pieces you wear together next to each other in the closet. And after you have everything back in the closet, pat yourself on the back for a job well done, then put your coat on and go shopping (you need to fill that new found space)! Or maybe a messy closet is just a messy closet. Great post and I too, need to declutter my home, office. That takes a lot of home space and It has been arrange also.